I feel as though I am always jogging my horse to keep up with my husband’s walking horse when we’re riding together. For those times when a long trot isn’t necessary—for saving one’s horse, enjoying the territory, or when going a not-so-far distance—a nice walk suffices. My husband isn’t into the slow jaunt, he is more of a got-things-to-do sorta fella. My view while riding with my husband is always some distance behind him. 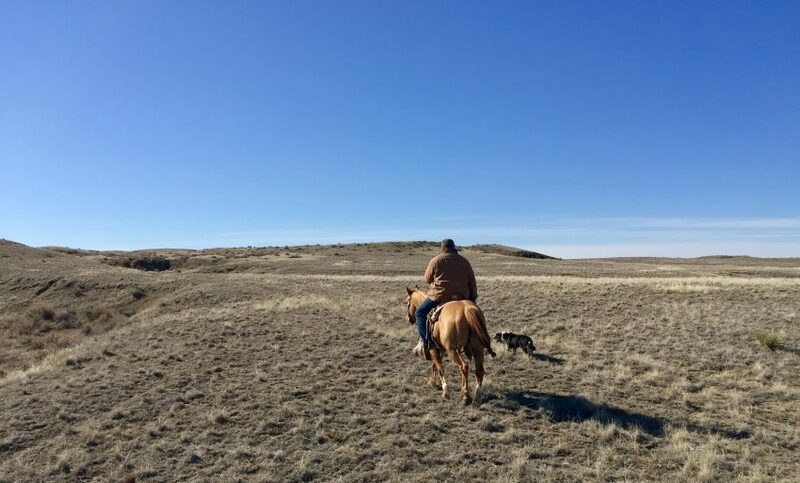 I strive to keep up, but he’s pretty good at getting his horses to walk out. Get in rhythm with your horse’s feet. When your leg naturally falls into the horse’s side is when the horse is stepping on that side. So if your left leg is coming into the ribs with the rhythm of the horse, that’s when you should apply leg and encourage and longer stride and quicker movement of the feet. Give your horse his head. If he can lengthen his body, it’s easier for him to lengthen his stride. He will likely get a rhythm going with his head and neck which will travel through his ribs up to you. Relax your horse and yourself. Being quite dramatic and loose with your legs will also allow you to feel when your legs are naturally falling into your horse’s side and when they come off those strides. Don’t force it, rather feel it. Ramp up the energy in your body. This doesn’t mean lean forward dramatically, but pick up a little life in your seat and torso. Think of swaying back and forth a little and forward a little with each stride your horse takes. You don’t have to do this forever, but when starting out encouraging your horse to move out at a walk, a little exaggeration from you can’t hurt. If your horse tries to step into a trot, be patient to begin with, especially if a long walk is new to your horses. Typically in the past, many folks go from a medium speed walk to a jog or trot, so allow time for your horse to readjust. Be sure, too, that you are in a walking rhythm with your body and not a trotting rhythm. If your horse breaks into a trot, you can keep “walking” with your body and make it awfully uncomfortable for your horse to trot. After a few attempts at reining your horse back to the walk—you won’t achieve a nice long walk if you hold your horse from trotting. Loose rein and trust is key here—and dropping the reins once more, if your horse still tries to trot, ask for a firm stop and maybe even back a few steps with nice collection. Drop your reins and return to your stretched out walk. It make take a bit, but your horse will get it. Repitition is a friend to the fast walk, and quite frankly, I often don’t walk out enough for my horses to be quite good at it in order to keep up with Boe. I tend to do more collected work, especially at a trot, but I do like a horse that will travel at a good walk. Below is a video of a nice walk that we hope our horses have. They generally have a trot of the same caliber in their arsenal as well as slower gaits.